Magical camping. Photo: Paul Kirtley. Each winter I like to get away to the snow. I enjoy winter mountain walking in Scotland. Ski touring in Norway is also a favourite. 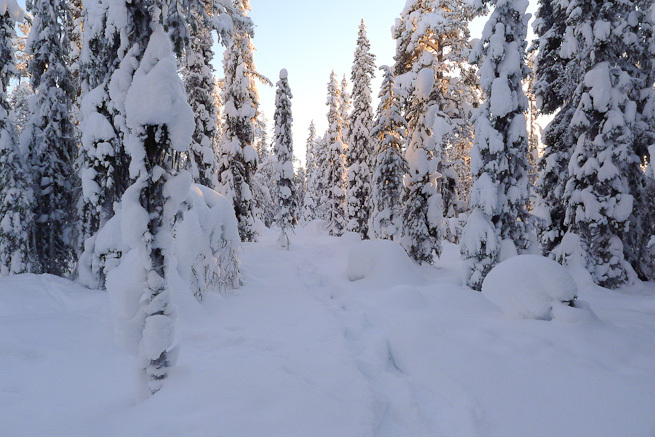 But the northern forest in winter has a special allure which is hard to escape. I’ve experienced this environment many times and I’ve certainly written about my love of it before. Despite many visits, the pull of the boreal forest seems to grow stronger with greater familiarity. I’m not the only one to be drawn by the magnetic north. Every year for the past few years I’ve teamed up with some like-minded friends and headed north. 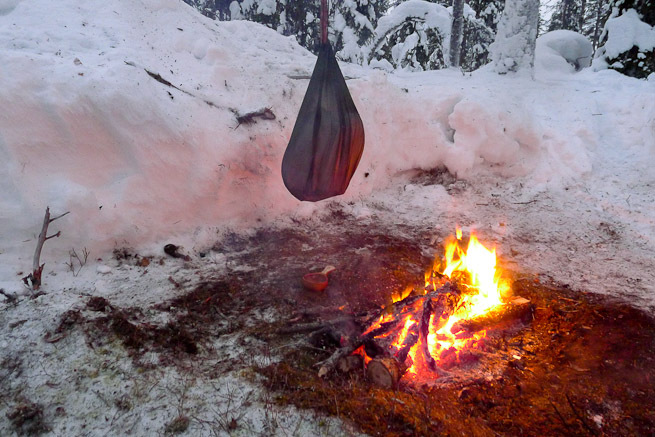 We’re all enthusiasts of winter camping and the accompanying traditional skills. It’s a mode of wilderness living, travel and interaction with the environment that, to us, just seems right. It has somehow resonated with us. 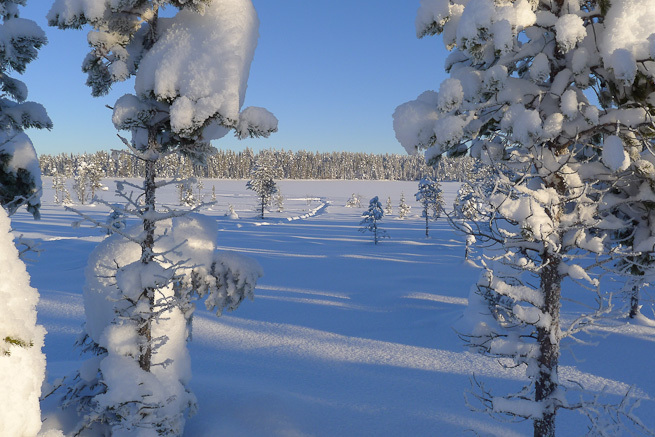 So it was that we again headed north – a long way north – up to the top of Sweden, once again in search of the boreal forest’s winter magic. In the past we have undertaken trips where the main objective is to cover a route. Between moving, setting up camp, sleeping and striking camp, there is little time to do anything else. Winter days are short and it becomes dark early. 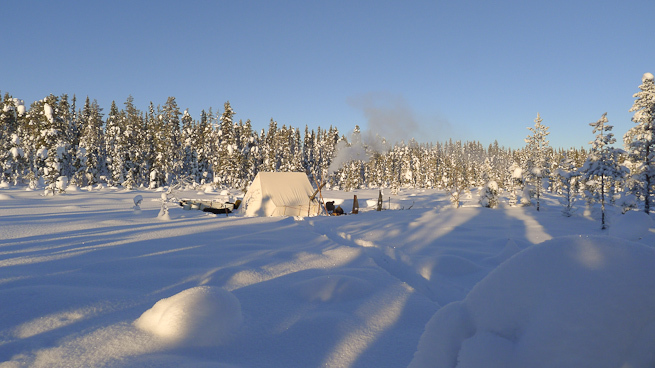 Until you stay in an area for more than a couple of nights, it’s hard to move beyond attending to only your immediate needs – locating, sawing and splitting firewood for the stove, melting snow for water and cooking food. On this trip we wanted to devote time to a greater diversity of activities. So we had planned to maintain a static base camp and make shorter journeys out from there. But even though we would have more time for the extra things we wanted to do, we were still keen to get into the forest as soon as we could. We arranged for a friend to take us out by snow machine and trailer and asked to be dropped off in an area we had visited before. The snow machine and trailer speeds off, leaving us to 2 weeks in the woods. Photo: Paul Kirtley. The first job was to locate and prepare a campsite. We quickly chose a flat area up away from the local low points which would collect cold air. Preparation involves treading an area of snow while wearing snowshoes. This transforms the snow, knocking the arms off the snow flakes and warming the snow very slightly. The snow then freezes into a relatively solid crust that can be camped upon. This freezing process takes a little while (quicker if very cold). While the platform was freezing, we headed up into the woods to locate firewood. We picked our path carefully so that it was an efficient route. This trail would be used repeatedly over coming days. One thing was clear – there was a lot of snow this year! We were very glad of our snowshoes, sinking into the powder only a few inches. Without them we’d have been up to our waists. Evidence of recent heavy snowfall was everywhere from the unconsolidated powder under our feet to the weight of snow balancing on all the trees around us. Lots of snow in this winter wonderland. Photo: Paul Kirtley. We explored the area and readily located some small dead, standing pine trees for firewood. These were felled, cut into sections and taken back to our camp. We also explored the area a little more and located additional dead trees that would see us through several days. These were left in situ. We also needed to collect various poles to support the stove and chimney as well as to peg out the tent. Once we’d sourced all of our materials, our camping area was hardened enough to set up the tent and get our camp organised. Tent up and getting equipment organised. Photo: Paul Kirtley. The sky cleared overnight and temperatures dropped. For the next few days we had low and stable temperatures, blue skies and sunshine followed by starry nights. Brilliant blue skies and sunshine. Photo: Paul Kirtley. 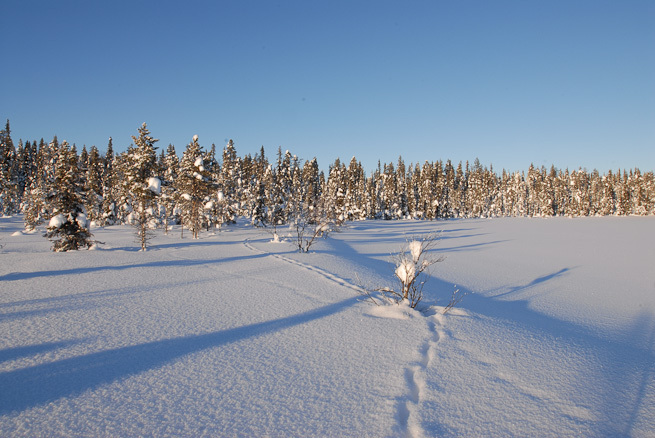 During the day we had temperatures of around minus 25 degrees Celsius (minus 13 degrees Fahrenheit) and night-time temperatures around minus 35 degrees Celsius (minus 31 degrees Fahrenheit). 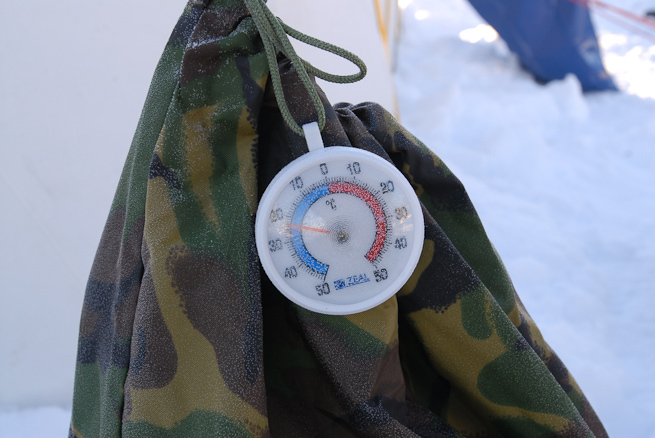 Daytime temperatures of around minus 25 degrees Celsius. Photo: Paul Kirtley. Under the brilliant blue skies the fresh white snow looked stunning and we had certainly picked a choice spot to camp. The vista from our camp was beautiful. View from our winter camp. Photo: Paul Kirtley. The plan was to be self-sufficient for 15 days. We weren’t going to be living off the land though. We were taking all of our food supplies with us. One of the objectives of this trip was to avoid the easy option of quickly prepared dehydrated packet meals and do more cooking from first principles than we sometimes have time for. So we had visited a Sami butcher in Kiruna and procured around 10kg of meat – a mixture of reindeer and elk. We also visited a local store for basics such as flour, butter, coffee, sugar, herbs and spices. We added this to other foodstuffs that had been prepared by a member of our group back in the UK. A tasty and calorific snack: Warm flatbread, butter and fresh coffee! Photo: Paul Kirtley. We did stick with our favourite packet porridge though – apart from the fact we really enjoy it, it’s quick to make in the mornings and we wanted to get up, out and doing things. What we did need from the forest, however, was plenty of firewood for cooking and keeping our tent warm, drying our clothing and airing our sleeping bags. Daily sorties into the forest for firewood were required. 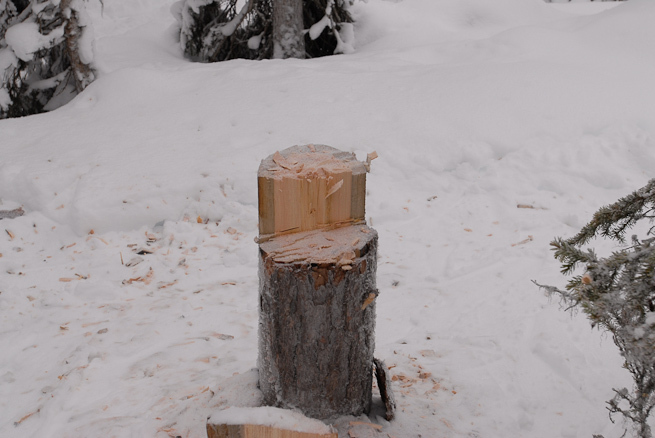 Efficient sawing and splitting turned whole trees into top-quality firewood. Stump of a felled dead, standing pine tree. Photo: Paul Kirtley. 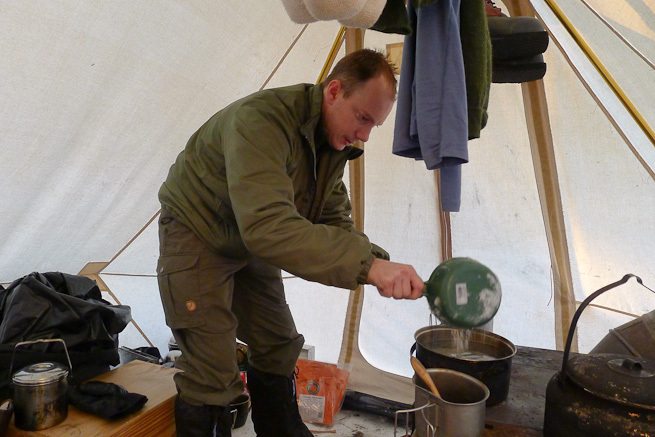 Producing water by melting snow was also an important and – when we were in the tent – an almost continuous task. A large kettle and a cooking pot ensured the four of us stayed well-hydrated and had plenty of water for cooking. Adding snow to the pot for drinking water. Photo: Paul Kirtley. One of my goals for the trip was to capture some skills for the winter forest environment for future blogs (watch this space!) and magazine articles. Firelighting – an elementary skill. Photo: Paul Kirtley. For this purpose I brought my digital SLR as well as the small camera I always carry with me. Whatever area of activity or hobby you are interested in, from time-to-time it’s good to go back, revisit the basics and think about why you do things in a certain way. As an instructor I always find this deconstruction and analysis useful. Water generation. Photo: Paul Kirtley. I really enjoyed running through my checklist of skills and photographing them. I went out on my own to do this and it was good to have time solo in the forest. Off I went on my snowshoes, carrying a small backpack and looking for resources. The forest in winter is very quiet, almost silent. Apart from the “craw-craw” calls of a pair of ravens, I occasionally heard the strange “clop-clop-clop” of a capercaillie. One day I spotted a couple of reindeer in the woods ahead, moved forward as much as I could and watched them moving through the forest looking for, uncovering and feeding on lichen. In addition to the animals I actually saw and heard in the forest, there were tracks and sign in abundance. Snow is a great medium on which to read tracks. Snow is so good at recording the detail of an animal’s activity, it’s hard not to be fascinated by what’s left behind. Fox tracks and territorial marking. Photo: Paul Kirtley. 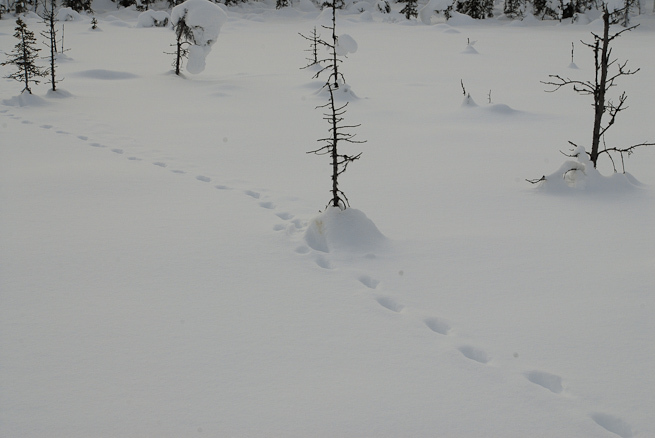 This year we saw a lot of fox tracks in the forest and crossing swamps and lakes. In fact there were more than I’d ever seen in my ten years of visiting this area of Sweden. Speaking to locals at the end of our trip we learned that the fox population had done very well on the back of a boom in rodent numbers last year. I’m guessing they were finding the winter a lot harder, particularly with the deep snow. Fox tracks skirting around a lake. Photo: Paul Kirtley. As well as fox tracks, we saw the tracks and sign of hares (not so many this year), reindeer, elk, capercaillie, ptarmigan (more than in recent years), stoat and even mice. When everything is covered in snow, though, it makes some things less obvious. Horses’s hoof fungus, Fomes fomentarius, grow over many years so these fungi are still present over winter. I spotted a few on birch trees in the area including some quite big specimens. Horse’s hoof fungus, Fomes fomentarius, growing on birch. Photo: Paul Kirtley. Whenever you camp in these forests the Siberian Jay, Perisoreus infaustus, quickly zeroes in on you. These inquisitive, bold birds are soon around the outside of your tent looking for tidbits of food. We had a group of four birds regularly visit us this year. There was one particularly brazen individual, who we called “fluffy” due to its particularly fluffy breast feathers, come right up to our feet when we were around camp. The birds took great interest in an old reindeer skin we kept outside, at which the birds would peck and try to remove tiny fragments, presumably for food. Partly due to weight and space restrictions, I didn’t take a telephoto lens along with my DSLR. In retrospect I wish I had. I would have had the opportunity to obtain some great shots of both the reindeer I encountered in the forest as well as the jays around camp. I had only my standard/wide lens with me. This was because in addition to the photos for skills articles mentioned above, I had two particular photographic projects in mind for this trip. 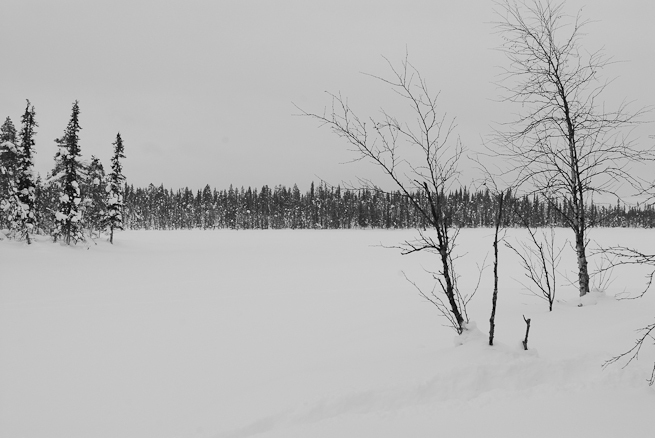 The first was to take some monochrome (black and white) images of the northern forest. This is not something I had done before but having attended a monochrome photography workshop in London last year, I wanted to experiment. In certain light conditions, the northern forest environment in winter can look almost monochrome anyway, with only subtle hints of colour; I was interested in the potential starkness of images without these soft hues. I also thought that black and white images of our camp might be someone reminiscent of those of the old pioneers and prospectors of the American north. You can see a selection of the black and white photos on my Flickr page. Boreal forest in monochrome. Photo: Paul Kirtley. The second photographic objective was to obtain images of the northern lights, aurora borealis. The winter of 2012/2013 had been predicted to be a good one for aurora, being driven by an 11-year solar maximum. We were heading out to the forest at a time when there was no moon either. As the clouds cleared and the temperatures dropped, the photographic conditions were perfect. The only problem was the northern lights didn’t show up. I did get some nice shots of Orion though (such as the one at the beginning of this article). We then had a period of warmer, cloudy weather with more snow. So no chance of seeing the lights even if they were there. It wasn’t until the second week, when the skies cleared again – with a waxing moon higher in the sky each evening – that we witnessed some aurora action. The first night was very faint though. With broken cloud drifting in from the north east, I called it a day. The next evening, the sky completely cleared (and temperatures dropped). I stood outside at minus 30 degrees Celsius and finally got a few good images. 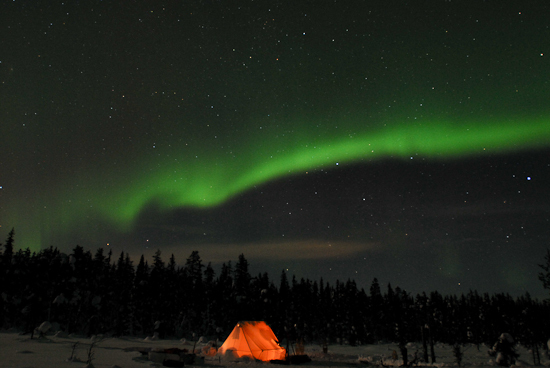 Aurora borealis, the northern lights, appear over our tent on a cold, clear night. Photo: Paul Kirtley. My kit and clothing for the north is a fairly stable outfit these days. I’ve established what works for me and I stick to it, keeping things as simple as possible. One thing I was very impressed with was hand made for me. To be more precise a pair were made for me. Following her attendance on one of my bushcraft courses over at Frontier Bushcraft, Elen Sentier was kind enough to knit me a pair of socks from North Ronaldsay wool. Comfortable and unrestrictive, they proved fantastic for arctic conditions. I wore them every day for two weeks over a pair of Thorlo mountaineering socks. The combination was luxurious. Elen’s socks have earned a firm place in my arctic outfit! 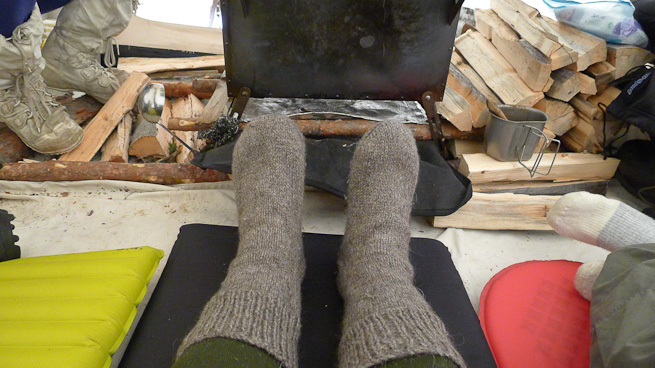 My North Ronaldsay hand-knitted socks. Photo: Paul Kirtley. Freed from man-hauling toboggans every day (as we have done on some trips), venturing out on snowshoes with only a day-pack seemed leisurely by comparison. We took advantage of this light order by exploring off the beaten track, striking out across frozen bogs, roving through deep snow, pushing deeper into the woods and skirting unvisited lakes. Heading back the way we came on one of our snowshoe wanderings. Photo: Paul Kirtley. The area wasn’t completely new to us though. We revisited places we’d been before, including the lean-to shelter from last winter. The shelter was still standing strong but under a lot of snow. In the time we were there we renovated the shelter, with Stuart doing much of the work. The old lean-to shelter under deep snow but readily renovated. Photo: Paul Kirtley. To me this further demonstrates the value of building these shelters well, especially if you intend to return to an area. It didn’t take too long to get this shelter back into good shape; much less time than building it in the first place. Again it proved to be comfortable and protective. More on this in an upcoming blog article. Because we had established a base-camp area that we returned to most evenings, our local friends knew where we’d be. We had a visit from one of our friends who is an extremely experienced snow-machine driver. He was passing on his machine and stopped off to deliver us some Swedish cinnamon buns known as bullar. Another day, a friend who has a team of huskies swung by for fika. We provided fresh coffee and again the offering from our guest was bullar. Husky team visit. Photo: Paul Kirtley. Huskies really are beautiful dogs and it was a treat to have a team of them visit our camp. When it came for them to depart they were really ready to go. The sun was already below the horizon. They were off like a shot and on their way home in the dimming light. Huskies on the move. Photo: Paul Kirtley. One of the aspects of wilderness skills that keeps my interest keen and my humility healthy is that there is always more to learn, both in terms of skills to be mastered as well as experience to be had. On this trip, I took the opportunity to experiment with various aspects of skills as well as further test a little-known shelter design. I will be writing more about this shelter in a future blog article as it deserves the space for a full explanation. 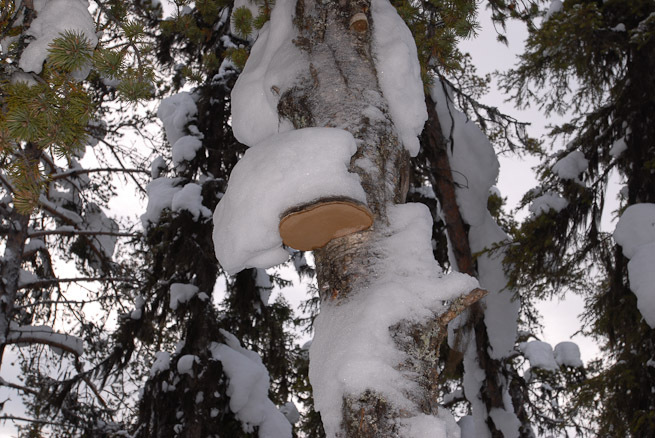 It proved effective and has applications wider than just in the boreal forest. There’s a sneak preview in the photo below. Emergency winter forest shelter. Photo: Paul Kirtley. During the afternoon of the day before our last, we organised our equipment and prepared for leaving. After a final night in the tent (and a monumental meal of meat we had left), we packed up and loaded our toboggans in the morning. We stacked the poles we had cut for the tent and scoured the site for any inadvertent littering, particularly inside the footprint of the tent, which does not have an integral groundsheet. We were then ready for our trek to the hamlet in which we had booked accommodation. We would be walking on established trails used by snow machines and dog teams and it hadn’t snowed much in the previous days. Therefore for the most part, we were unlikely to need to wear our snowshoes. We kept them handy on top of our equipment though. We each hauled a toboggan. My toboggan packed and ready to go. Photo: Paul Kirtley. Our walk back to the village was uneventful and we made good time. After some time spent unpacking, the sauna was up to temperature. I’m a big fan of saunas and steam rooms anyway but after 15 days in the forest, this was bliss. Our walk, a sauna, good fresh food and a local beer saw that we slept well that night. For the following day we had hired a snow machine each for a tour of the wider area. Now snow machines are noisy and smelly (although less so than they used to be). They do have an impact on the environment. 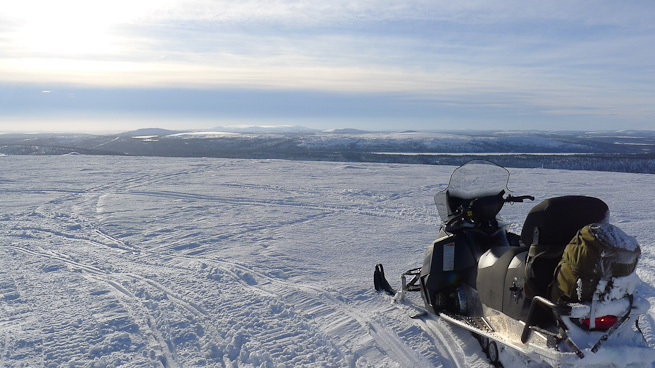 But they do provide an important means of transport in winter for remote communities. 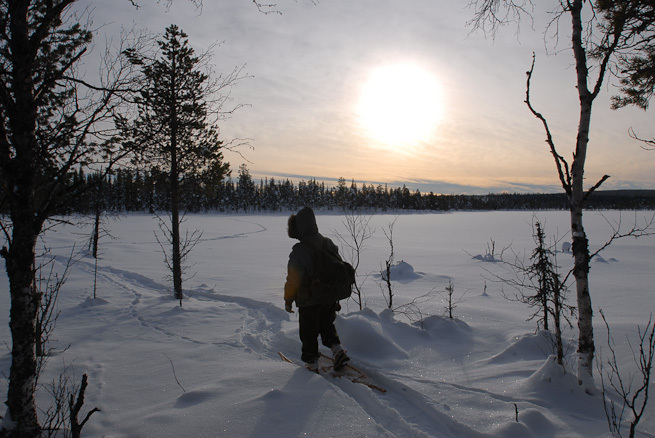 Tourism provides significant employment in the north of Sweden. 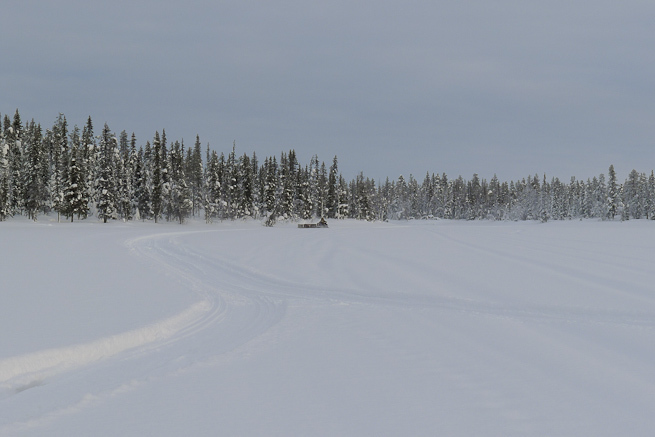 Snow machines are needed for transporting guests, servicing remote lodges and cabins and for helping to keep dog-sledding trails open in an efficient manner. You are never far from snow machines in this part of Sweden and if you spend time up here, it is worth learning how to drive one properly, including having an understanding of the risks. They are also fun to drive. So we had reserved our last full day in Sweden for a snow machine tour of the area. We consulted our experienced snow machine friend for potential routes, to learn the state of some of the tracks in the area, where there was overflow water on lakes and where it was safe to cross various rivers, as well as areas to avoid. We devised a good route, including some areas I had not been to before. The high-point of the route – both literally and figuratively – was the summit of a mountain. It’s a large rounded hill with a broad shoulder and access from the eastern flank. To get to it we headed south through the forest, back past where we had camped and onto a large lake, then back onto a winding trail through the forest. With whippy birch saplings and twigs across the trail in places, it’s important to wear goggles to protect the eyes. The trees were interspersed with crossings of various swamps and small lakes before plunging back into the trees. Eventually we swung east and powered along a chain of lakes. Here we got our first clear view of the mountain in the distance. Our first clear view of the mountain as we approached. Photo: Paul Kirtley. After checking the map, we continued on our route east, picking up the main north-south snow machine trail as it crossed the lake. We headed south again over increasingly undulating terrain until we picked up a trail that runs up the flank fo the mountain. This trail reminded me of my old BMX days, with steep rises, flat table-tops and steep drop-offs. Just on a larger scale. It was quite technical and more of a challenge to drive than the previous 30km but definitely exhilarating. And not just for the driving. As we gained elevation, we started gaining tantalising views of the surrounding area. When you are in the forest, you can’t see very far. You can’t see outside the forest and except for looking at maps of the area, you don’t really get any sort of overall view of the terrain with its blanket covering of trees interlaced with lakes, rivers, swamps and bogs. There are very few vantage points here. So it was a real thrill to rise above the tree line and look out on the expanse of wilderness that surrounded us. An elevated view of the surrounding terrain. Photo: Paul Kirtley. From this saddle point in the landscape we headed off the trail and onto the shoulder of the mountain. We followed the main broad ridge up towards a top. Being a UK-qualified Mountain Leader, I’ve spent many a day walking to the top of hills in the Lake District, Snowdonia and the Scottish Highlands. I also love being in the hills in winter, winter boots on and ice axe and crampons packed, trudging through the snow on brilliant, sunny, clear days. The fact that we were now effortlessly powering our way up a UK-sized summit on snow machines seemed like cheating. Frankly it’s not something I’d want to do regularly. I felt like I was sullying the mountain somewhat. At the first summit we all agreed, though, that it was an incredible experience. Powering along the broad ridge towards the first summit. Photo: Paul Kirtley. We had picked the perfect day for the trip. It had started overcast and not overly cold. As the day progressed the sky cleared from the north-east and the low-angled sun eventually shone across the landscape. By the time we were at the highest top of the hill we had clear views of all the surrounding terrain – an expanse of forest and lakes to the north and east with more hills to the south and west. View from the top, looking south-west. Photo: Paul Kirtley. We didn’t linger too long at the top and soon found ourselves retracing our tracks back up to the second top then down the broad ridge to rejoin the roller-coaster trail. This descent took us back to the main snow machine trail and we soon crossed a lake and were back into the forest proper. Another 30km of forest trails and we were back where we started having had a thrilling day out. It was very different to the majority of our trip which comprised quiet enjoyment of the natural environment in a peaceful corner of the woods. But after 15 days in the same area this had started to feel a little claustrophobic. A day out exploring the wider environment was refreshing and re-iterated the scale of the terrain. 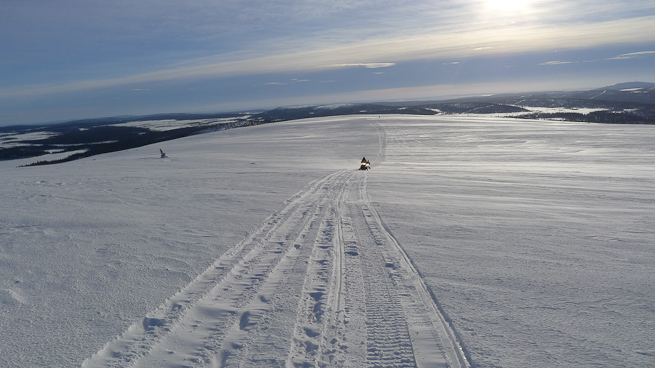 We had covered 75km on snow machines and barely scratched the surface. Warm atmosphere at the ice bar. Photo: Paul Kirtley. You might be reading this and thinking I’m lucky to be able to have these adventures. And you’d be right; I do consider myself lucky. That’s one of the reasons I like to share the experience as much as possible. For me it’s also a valuable reckoner. The arctic is an environment which is potentially lethal to the uninitiated and poses many risks even to the seasoned visitor. No matter how experienced you are, you must respect the north. I’m very comfortable living in the woods in the UK. It’s easy. When I head to the boreal forest, I raise my game. Everyone has to. Skills must be efficient and care must be taken. You rely on your skills and knowledge on a daily basis rather than merely practice them. For example, I’ve noticed the improvement in the axe skills of my friends over the years we’ve been winter camping together. These guys are not professional outdoors instructors yet their axe skills are now on a par with many I have worked with. These trips allow me to reflect upon what is important. This is partly the environment and partly the mental space it allows. It’s quiet. There are few distractions. My phone is turned off and I’m away from the day-to-day running of Frontier Bushcraft. I spend time with my friends and, in the absence of TV, stereos and the internet, we make our own entertainment; I never laugh so much. It’s also great to return to an area that I’m familiar with and visit friends there too. It’s interesting to return home after these trips. I feel physically stronger, mentally refreshed, more relaxed but at the same time sharper and more focused in my bushcraft skills and their real-world application. It’s also a juxtaposition going from the depths of arctic winter to a relatively benign UK season that is on the verge of Spring. 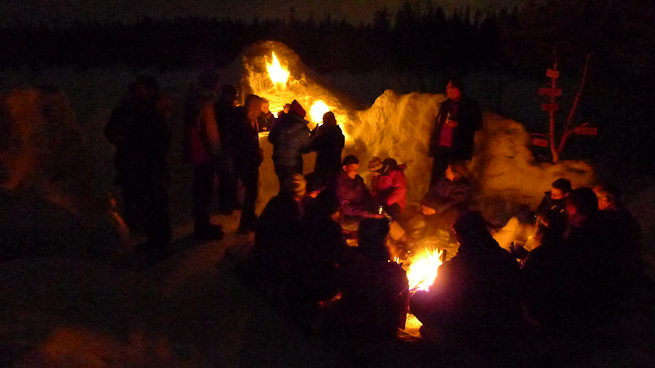 I’m always extremely busy teaching bushcraft courses in the Spring and Summer and my annual winter trip north sets me up for the rigors of this course season perfectly. But I’m always looking forward to my next return to the northern forest…. Let me know in the comments which photo you like the most or which area of this trip you found most interesting/would like to hear more about. Great article and I’m jealous of your trip. I’ve been to Sweden a couple of times (Including a winter trip a couple of years ago) and for all kinds of reasons it is very definitely a special place. I’ve not had the chance to spend as much time in the north as I’d like and after reading this I really must remedy that soon. Many thanks for sharing and looking forward to the following articles. Thanks for your comment. I couldn’t agree more – Sweden is indeed a special place. I’m glad you liked the article and thanks for your feedback. What kind of tent is in your photos? I’m very interested in something like this for myself and my sons to use while caribou huntng… Can you give a manufacturer name or direct me to a website so I can look for more info? What a cool adventure… I always ejoy reading your website! Thanks for your message. It’s good to hear from you. Thanks also for your feedback on my website. I’m happy to recommend these tents. They are made by Snowtrekker Tents in the USA so it should be reasonably easy for you to get hold of one. If you purchase one, let me know how you like it. My boys and I have been out skiing… Nothing extensive, in fact we are never really more than a mile from our house, but it is still fun. I’m trying to get my boys interested in doing biathlon competition, so we take turns skiing with a .22 rifle. If you ever do any ski trips, I would be very interested in reading about them. Keep up the good work! I haven’t had time to do any proper ski touring for a couple of years. I really should schedule a good, challenging tour for next winter. Good article, as ever Paul, the northern woods are somewhere I am very much looking forward to experiencing one day. I’m actually commenting to point out how interesting (to me at least) it is that on the day a walrus appears on North Ronaldsay you mention the wool from the sheep up there! I always find such events, whether it is true synchronicity or not, rather special. Of course, given that I grew up on Orkney, it’s not surprising that I noticed both references to one of the islands, but it made me smile. I do wonder about coincidences such as the multiple Ronaldsay mentions. These things happen to me from time-to-time to and make me wonder. I also wonder if we are just very sensitive to coincidences. We’re very good at seeking out patterns in nature and elsewhere. Fantastic read, you must have had an awesome time! great photos – couldn’t pick a favourite… but the photos of the tent setup were great as i’m currently looking into a Snow Trekker tent and seeing the way you had set up around the wood stove was very informative! (thanks for the reply on FB about this too by the way) looking forward to seeing the other posts relating to this one. Thanks Paul, all the best. Paul. Thanks for your comment – good to hear from you on my blog as well as on FB. I’m glad my pics and comments have provided some guidance. Please do get in touch if you have further questions. I’ll get to work on my other blogs too!…. 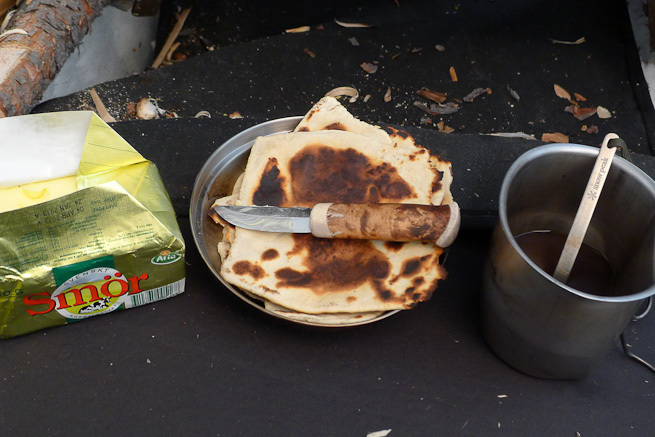 Now thats what i call a bushcraft trip, nice one Paul, it looks awesome and the flatbread and coffee looks very good to. Thank you for sharing another one of your phenomenal ‘trips’ with us. The ‘completeness’ of your ‘Applied Bushcraft’ is a lesson to one and all. 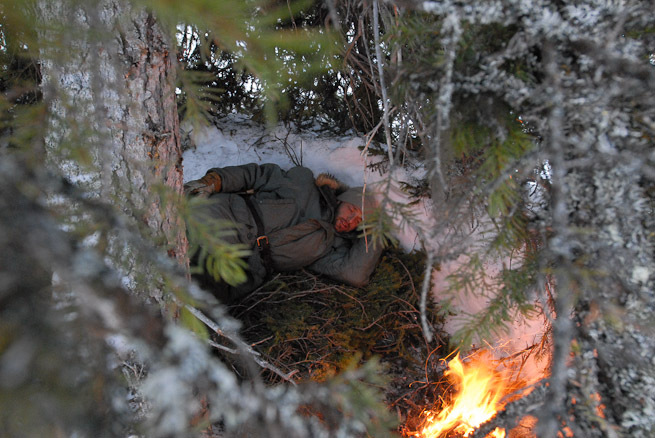 The article and your trip demonstrate how to really enjoy yourself in a wild place using Bushcraft Skills. The excellent photography, your knowledge, the skills required to live safely in this environment, the forward planning and respect for such a place are evident throughout. Looking forward to some ‘articles’ and perhaps even ‘video’, based on Boreal winter skills.Perhaps Frontier need to start some Winter courses………. Good to hear from you and good to know you enjoyed the blog. Thanks for your kind words. I know the northern forest environment has a special significance for you. I’m looking forward to posting more content on here and I hope one day we might travel in the north together. Thank you for doing these blogs, they give me a welcome little dream away from my city desk. A place I think you know all too well too! Having spent over 30 years enjoying snow in the form of skiing and spending much of that time off piste and passively being away from others, I have to say that after seeing this article and the beautiful pictures (especially the unpolluted night sky photos, with cosy tent) somewhat changes my perspective and my appetite. I’ve spent a great deal of time looking down through woods and from chairlifts at the various tracks through virgin snow of Chamois, Murmeltier and other creatures unknown (to me), wondering all sorts of, how, why, where and especially “what if” things. I think I now need to follow and find out. A couple of your colleagues have also told me how much they loved the northern forests, but it’s difficult to visualise and understand. Having now read your article I think I have a much better idea. Apart from a trip I must make soon, taking the kids up to meet Santa, I think I will have to make a trip of my own to really experience for myself just what it is about “The North” that you and your colleagues have so enthused and that you have now so tantalizingly written about. I look forward to reading your other related articles and perhaps to actually see, hear, smell, touch and taste for myself. It’s nice to hear from you; it’s been a while. I’m happy that I’ve been able to open a window to a different, snowy world and some respite from the City grind. I like the look of the tent that you use. It makes all the difference to be able to dry your clothing with a fire. By the way, have you had any experience of the Tentipi (formerly known as the Moskoselkåta)? I had some good times with it. Once it was even transformed into a Sauna after a long trek where a bath was necessary next to a Jokk (river). Yes, I have used Tentipi/Moskoselkåta. They are well-made and nice to sleep in when the stove is going. They are good shelters with lots of floorspace. There are a couple of downsides to this style of kåta though. First is that there is no easy way to hang things up above you. In a traditional kåta/tipi/chum with poles from ground to apex, you can attach lines or even a rack to the poles on the inside. So, it’s hard to dry many garments and boots etc in the modern design. The second thing is that I’m not a huge fan of their stoves. The old style (vertical cylinder with small door at top) was impossible to cook meals on top. The new style (horizontal with flat top and front door) is much better for cooking, heating water, etc but is very, very heavy. So I think the Tentipis would be even better with a lighter stove and some internal attachment points for drying lines inside. I’ve never used one for a sauna. I will have to try that one day. Sounds great! Thanks for your comments. It’s nice to hear from you. I’m happy you liked the blog but sad it made you homesick! 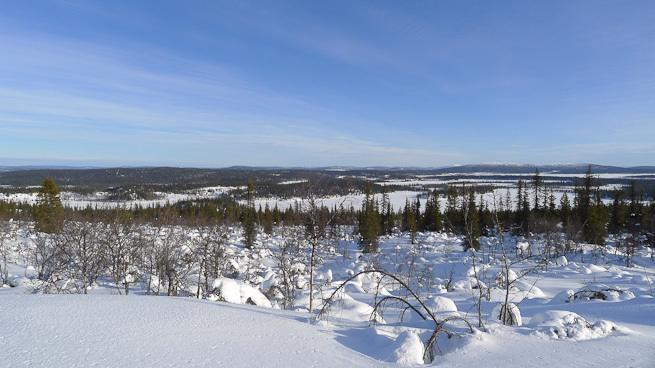 We were about halfway between Kiruna and Gallivare. Thanks also for your kind words about my blog. It would be a pleasure to have you on one of my courses. When you are looking at course dates, drop me an email to make sure you know which ones I am teaching. Hello, Paul, it’s a pleasure to “meet” another winter lover. Thank you for including my link in your wonderful article. What an experience that must have been! We have been backcountry camping in Denali National Park (Alaska USA) but in the summer, not winter. It’s definitely something I want to experience. I’ve bookmarked your site and will visit again. Welcome and thanks for your message. Thanks also for your great site – there’s lots of useful and interesting information on there. 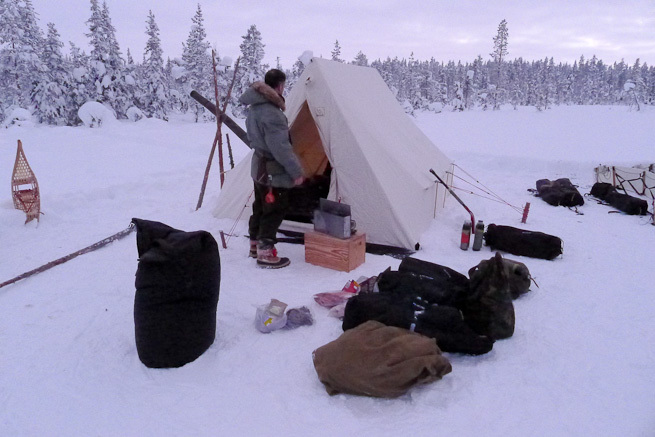 You should definitely give (hot-tent) winter camping a try. It’s a great way to live in the woods in winter. Please do drop by again and say ‘hi’. I’ve bookmarked your site also. How do thou do Paul ? Again it’s nice to read something with prestige. I’m doing good thanks. Hope thou is also? Great post! We’ve just got a spring present of a fresh 12″ of powder here in Minne-snow-ta, and I’ve been enjoying some nordic skiing. Not sure if I’ll be able to get another camping trip in before the thaw though. While we’re lucky enough to have access to similar experiences here, from what I’ve heard I’d really like to experience a winter trip in Scandinavia. Your photo of the Northern Lights in incredible, but when you asked for favorite, I have to choose the Snowtrekker with the stars above. I have the same tent! No photos anywhere near that good though. In terms of wanting to hear more, I’d like to see what you did with your tree pit shelter. Really enjoy your site, thanks Paul! Good to hear from you. I’m envious of your fresh snow and skiing opportunity. Spring definitely seems to be taking hold here in the UK. It was getting up into the mid-teens Celsius in the woods in Kent today. Thanks for your kind words about my photos. The night shots seem to becoming the firm favourites. I’ve had a lot of positive comments about them, particularly on Facebook. …..thankyou for the pictures….the well written blog….and magical experience of sharing an experience. Aww Leena, thank you for letting me know you enjoyed it so much. I’ll keep on sharing for sure. In fact I still have some material – video and pictures – to share from this trip. Thank you for a well written, interesting article, with some really nice photography to go with it as well. I just have one small suggestion. It would be nice if you included a disclaimer regarding the felling of dead standing timber when in the Swedish boreal forest. This is according to allemansrätten, even on crown land, not allowed (what is allowed is collecting dead loose material, branches, pinecones etc. ), as I am sure you are aware. So you must obviously have come to an agreement with the land owner when making camp on this stay, am I right? 🙂 This should be included in the text, so as to not confuse prospective foreign visitors! Again, thank you for a really good read! Loved reading your articles and seeing your videos. After a summer of living outdoors in the Netherlands and trying out my 3 season equipment, I am looking into some winter adventures. Rereading your blog was inspirational for me. I am slowly rearranging my work schedule to make some adventures possible. Eventually I hope to just work to for ve money for longer trips. Do you have any recommendations for adventures in the north like Norway or Sweden? I will have my companion, my Labrador with me. I am just looking for ideas at this point. Thanks in advance for any and all advice. Wishing you fun. It’s good to know that you are finding value in re-reading some of these blogs as well as gaining confidence from your outdoor living so far. There is a lot of scope for adventures in the north. 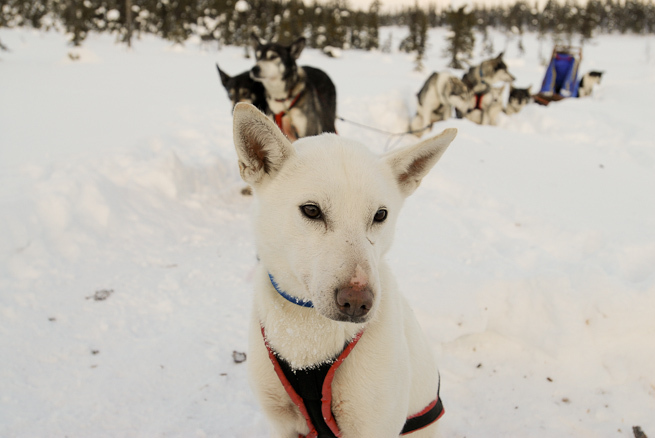 It can be hard to undertake human powered journeys on your own but it would certainly be worth looking into the numerous dog sledding adventures available. 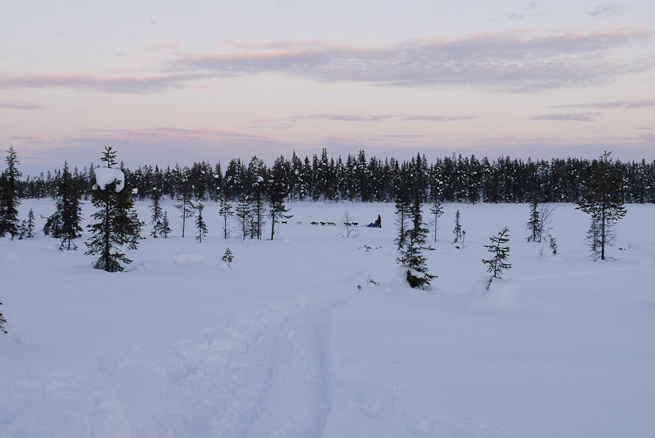 Really professional write up and photos of your cold winter trip in North Sweden. I am planning a trip myself departing Germany with my Jimny Jeep in Mar 2016. Could you pass me the contact information of the person that took you and your equipment into the Camp site. I am solo and wanting to be taken to a lake and left for 5-8 days Maybe more or less ???????? Will be hot tenting also. Have room for more folks that might want to go so pass information to them. Time is no problem for me,,,,,,,I am totally retired. Hope I will have same great experience as you in the North Woods of Sweden. Cheers Andrew. Glad you enjoyed it. Yes, the flat bread is simple yet surprisingly satisfying. Really enjoying your blog, what a great discovery! I’ve spent quite a bit of time in the Arctic myself over the last couple of years and was admiring your handsome toboggan. I wondered if a) you had experience of the rigid plastic/fibreglass pulks (which is what I’ve always used) and how they compare with a toboggan (e.g. is it a case of horses for courses? Toboggan for deeper snow, pulks for more wind-packed surfaces etc.) and b) where you purchased such a toboggan! I’m happy to hear you have been having some northern adventures of your own in recent years. Have you been back to Svalbard? Regarding pulks vs toboggans it is very much horses for courses. 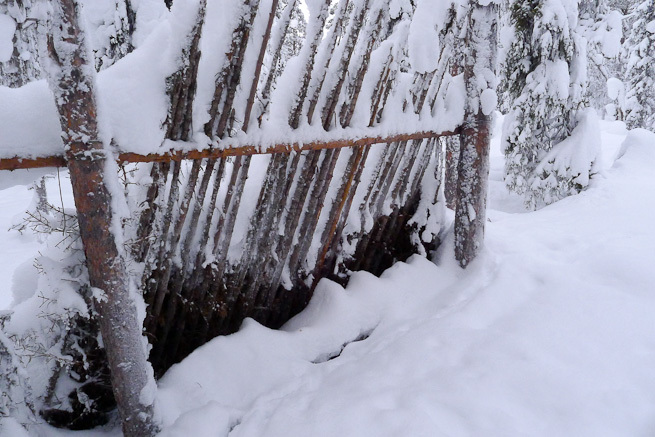 Toboggans (traditional steam bent wood or modern plastic) have the advantage of conforming to the terrain and spreading the load well over soft snow. They’d be a nightmare to haul on harder packed slopes. 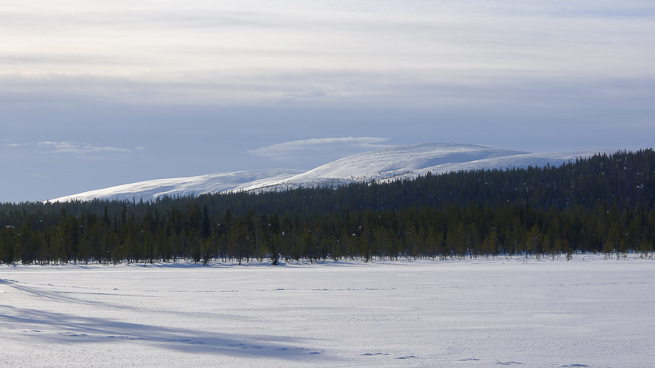 If I were skiing in the Norwegian mountains, say, I would definitely be using a pulk. I’ve used various Scandinavian ex-military pulks in both Sweden and Norway – they work but are quite heavy. The rigid connection some have to the skier via a belt, help to an extent on downhills (they stop the pulk running into your skis or you) but they are still much better if you have someone behind with a rope and snow-plouging to slow the whole system down. The best pulks I’ve used are made by Snowsled, which unlike the Ventile jackets I mentioned in episode 20 of #AskPaulKirtley, are definitely still in production. 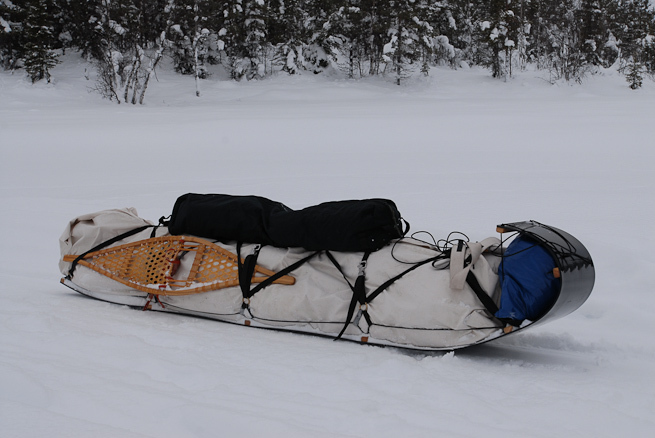 The toboggans on the other hand are made by Black River Sleds. Again, very good to hear from you after all this time. Brilliant, thanks very much for the info Paul! Yes indeed, I went and lived in Svalbard for a bit over a year (in a tent – was rather chilly!) training and working as a guide. Completely wonderful experience, though I never saw a toboggan out there. They look most intriguing, I’ll have to give one a try! RE the going downhill conundrum, we had rope traces (mostly due to funds), so to stop the pulk from interecepting us, our answer was to tie a “handbrake” to the front – a piece of knotted rope that you can drop in front of the pulk to provide some drag when the going gets steep. Worked a treat. By the way I stumbled over the blog while looking for a review for the Hestra Ecocuir Ventile Mitt, which you wrote about a while back in a quest for the perfect winter handwear and I found invaluable. If you never got the Ecocuir Ventiles, they’re fantastic – had quite a few struggles with managing ice build-up in Hestra’s full-leather range, obviously tricky to reverse when travelling expedition-style. The ventiles were a big step in the right direction for remedying this. Great to see your practice so obviously thriving – I’ll stay tuned! Thanks again for the response. 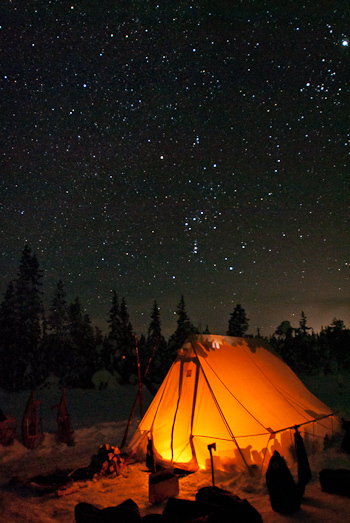 Love the picture of the northern light (nordlyset), and the “glowing” tent. Great picture. As an addendum, Paul, I quote you now, “I spend time with my friends and, in the absence of TV, stereos and the internet, we make our own entertainment; I never laugh so much. It’s also great to return to an area that I’m familiar with and visit friends there too.” In my humble opinion, that is what bushcraft is all about. 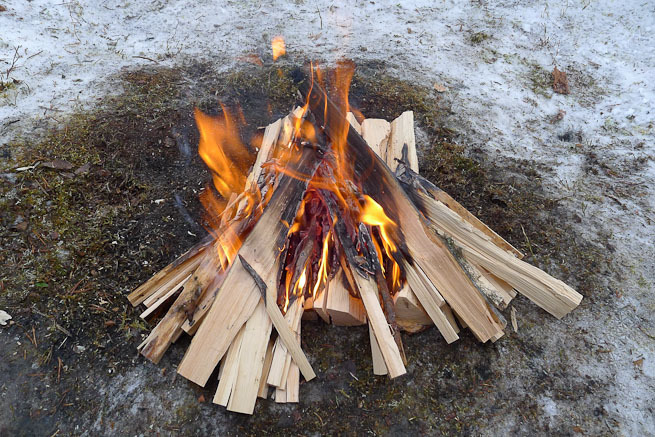 It is not about competing to see who can lay the best fire quicker, of whose feathersticks are best, or what to pack, etc, it’s about the reality of the experience which bushcraft is intended to create. As Bruce Lee stated once, in the beginning of his learning martial arts, a punch was a punch, a kick was a kick. As he grew in experience, a punch was more than a punch, a kick more than a kick. Once he became a master, the punch was just a punch, the kick, simply a kick. You are the master here. I salute you and envy you a little as I certainly miss these experiences which I took so for granted in my youth. Relish these times. They come only once. Great article, my friend and I fly to Tromso in two weeks fo a weeks camping and after seeing your photos im so excited! I still stop by here now and then, love the blog. Now *we* live in the Northwoods too. And sometimes, we have the aurora as well. Hi Susie, nice to hear from you. Glad you are enjoying the north woods. Thanks for sharing your aurora images – lovely.